When I was 14 I asked my parents if I could have a spot in the garden to grow vegetables. I am not sure where I got the idea. Perhaps it was from growing up watching our elderly neighbours harvesting cabbages and cauliflowers from their backyard. We used to skip in and out of their yard, picking mulberry leaves for the silkworms at school and crouching beneath their old camellia bush to peel the petals from the fallen buds. I planted tomatoes, capsicum and snow peas in two rows with a neat sawdust path running between, and would tend to it each day, watering and weeding and breathing in the smell of tomato leaves between my fingers. While my friends were in the city shopping and chasing boys I was wearing my mum's old overalls and harvesting tomatoes with dirt between my toes. I still remember the pride with which I served them for dinner - bowls filled with luscious red fruit bursting with flavour. For many years I have been a frustrated gardener, whose dreams were far bigger than the patch of earth in which I planted. I don't know whether I have succeeded in growing a decent tomato since I left home. But here I have found a garden to fulfill my yearning to feed my family. For the first time in the 20 years I have been keeping a vegie patch I have six beds to rotate vegetable crops through, all of them flooded with sunlight and irrigated by rainwater via a tank that collects the shed's runoff. We planted out handfuls of heirloom seeds a month ago and have been watching with great excitement as our summer vegetable garden germinates and grows. I have since mulched the beds with oaten hay and spread sawdust from a local cabinetry workshop around the beds to keep down the weeds and deter the snails. Already we are picking a salad every day from our bed of greens, and come summer we will be eating tomatoes, capsicum, eggplant, basil, garlic, peas, beans, corn, zucchini, beetroot, melons, cucumbers, radishes, cavolo nero and bok choy. The carrots, pumpkins, onions and potatoes should be ready for an autumn harvest. Raspberries and boysenberries are growing up the fence behind the beds and the boys are plucking blueberries from the big blue pots in our courtyard. Down in the backyard the fruit trees, most of them just bare branches when we moved here in winter, are revealing their secrets. There are two big plum trees, a nectarine and an apricot, two almonds, three apples, four pears, a fig tree, four loquats, a mulberry, a quince, grape vines and a lemon. I uncovered two tiny citrus trees which were being swallowed by the weeds and choked by the tubers of flowers I have since dug out and replaced with a bed of asparagus. There are oranges and mandarins and I have planted avocados, grapefruit, pomegranate and limes, rhubarb, kiwifruit, passionfruit, gooseberries, guavas and beds of strawberries. I have weeded and mulched around each tree, scattering pellets of organic blood and bone while the chickens scratch happily alongside me, gobbling up grubs and worms. They now scratch in the mulch each day and are keeping the weeds at bay without any effort on my part. Lovely big piles of compost are breaking down in our three compost bays, and I fork them over while the boys work alongside me in their sandpit, constructed from the lengths of cypress left when we felled the big old tree. They kick footballs amongst the fruit trees and ride their bikes down the gentle slope to the chook pen to check for eggs and cuddle their girls. It is a garden we all love to be in. With time it will feed us. Every time I walk through it it makes me happy. What a beautiful post - and I loooove your photos. 2 of my 3 boys love to help me in the garden and love watching their herbs grow. Master 12 has never really liked getting his hands dirty - I don't think he'll ever make much of a gardener - lol. You bought back so many memories with your comment about the silkworms - I remember pestering mum and dad for fresh leaves every day. 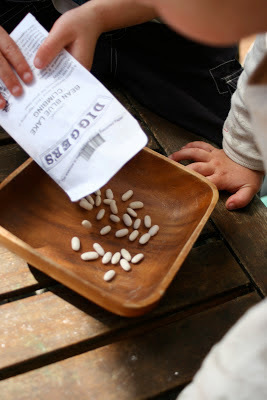 We are trying to get the boys to remember to feed their silkworms right now, but failing! I think that you need fairly fine sawdust to keep the slimy critters away. We intercepted a snail crawling happily across our quite coarse sawdust yesterday. The ducks gobbled him up happily - really the very best slug and snail defence of all. Good luck with your snowpeas. And give some beer traps (containers dug into the ground and half filled with beer) a go - they work a treat! Wow, 20 years is a long time to wait for your veggie garden. How you deserve it. Such an abundance of fruit trees, so fortunate. Your garden sounds just wonderful. I hope you'll post more photos of it. Beautiful post as always but I just want it on record that when I was 14 I was into neither boys nor shopping! How fantastic! To finally have your gardening dreams come true :) I've planted a few things, but kept it small, it needs hand watering and being away in December it will most likely fall in to a withering heap. At least I bought tomatoes for $4 a bag this week instead of $10! There is always next year! Al, your garden sounds very productive! If you don't have success with some things, it could be your location. But then, you are a green fingers, so many things that won't grow for most will grow for you! We've got the withering and dying thing here in the summer - just purely because of the heat. But I was to blame one summer for the death of your veggies I know as I didn't go and water them as often as I should. Reticulation is great isn't it! ?I have enjoyed reading your updates! And seeing your photos too. Darcy and Lysander - I hope they get a bit of time together this summer. Lysander is also The entomologist and mr nature. He has been orchid hunting with me on more than one occasion! as an inner city apartment dweller, i have to say that i'm jealous of your garden (and your ducks)! That is a delightful garden tale. The vegie gardens are fortunately in the front yard, and there are gates and fences keeping the chickens and ducks down in the big backyard area, where they can free range to their hearts' content. They have been having a go at the avocados and passionfruit I have planted around their yard though, so I have made the plants some wire cages until they are a bit bigger and tougher - it helps keep the mulch around them as well.